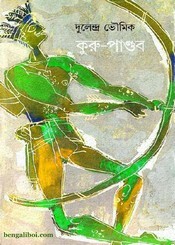 Beginning with short stories, the first published story 'Badhyabhumi'. Many stories of his writings have been published in various Little Magazine, Weekly Basumati, Anandabazar etc. He was skilled and equally popular in all types of writing. His writings were very popular for the children in different Sharadia patrika. Along with the literary world, he was a success journalist. Dulendra babu wrote a lot of essays, novels, and films related story. The author wrote several novels under the pseudonym 'Anjana Das'. Now I want to share a humorous book of his writing- 'Kuru Pandab'. The ebook pdf has 115 pages, 4mb file size.